Eager to begin the adventure, a highly competitive start saw the fleet fully powered up, beating into the Caribbean swell. At Green Island the fleet eased sheets, hoisting downwind sails and accelerating into a power reach that should last for at least 48 hours. Three hours into the race a battle was raging at the front of the fleet between Jens Kellinghusen’s German Ker 56 Varuna and the turbo-charged AmericanVolvo 70 Warrior, sailed by Stephen Murray Jr. After blasting around the windward east side of Antigua at over 20 knots, Warrior was just three minutes ahead of Varuna on the water. Varuna then gybed west, while Warrior chose to stay just east of the rhumb line. As the leading yachts approached Barbuda, Varuna was launched up the leeward side of Barbuda in flatter water, whilst Warrior opted for the roller-coaster ride up the windward side. The two yachts were virtually neck-and-neck as they left Barbuda, but Varuna was seventeen miles west of the rhumb line. Eric de Turkheim’s French Nivelt-Muratet 54 Teasing Machine was third on the water. 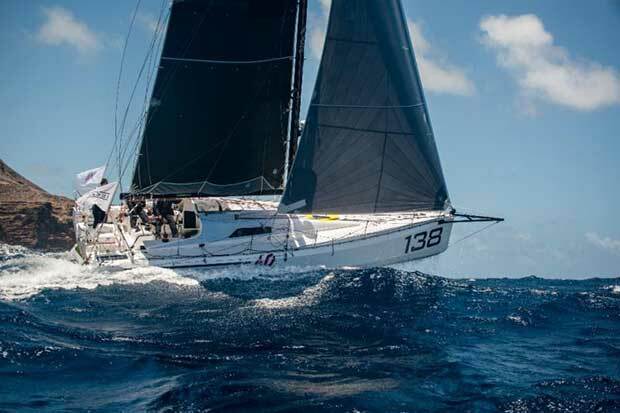 Three miles behind Teasing Machine, the chasing pack was led by three German yachts; Arnt Bruhn’s German Class40 Iskareen, Sebastian Ropohl’s JV52 Haspa Hamburg and Joachim Brünner’s Andrews 56 Broader View Hamburg. 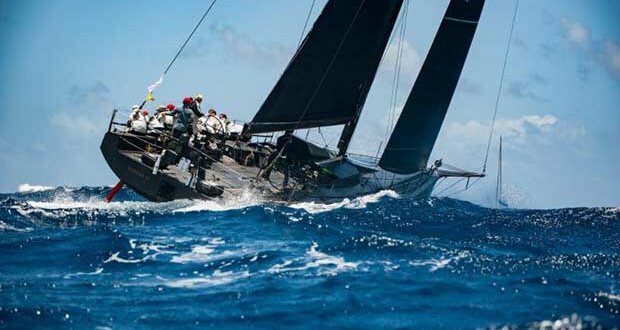 All of the teams racing in the 2018 Antigua Bermuda Race are expected to pass Barbuda before dusk; the next land they will see will be the finish at Bermuda, over 900 miles away in the Atlantic Ocean.